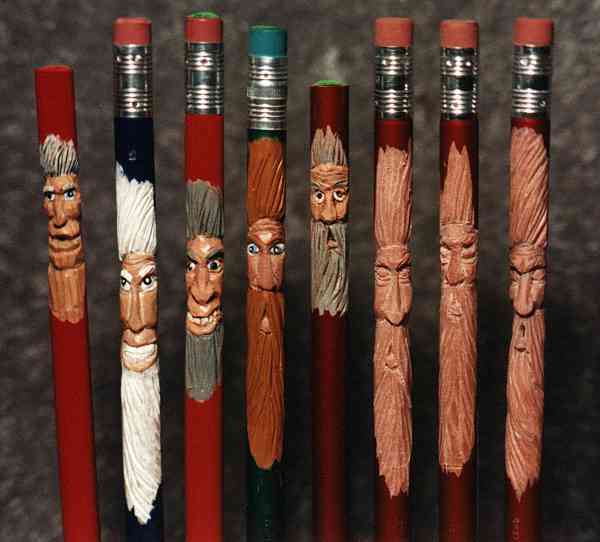 I just have to share a little joke on myself before I start writing on how to carve a wood spirit in a pencil. I used to teach a bit of wood technology which included wood identification. Well now, when a person like me gets a new piece of wood in his hand he will naturally cut a thin sliver off the end grain and get his old hand lens out for a closer look. Hummm I said, this looks like a diffuse porous tropical hardwood, it has some very shiny tyloses clogging the pores, I just don't know what wood this could be!!! Boy was I ever embarrassed when I found that some pencils are now made from extruded plastic!!! HEHEHE!! The pencil on the left in the above pictureis a wooden one, the wood being a pencil cedar, of course. This is a bit of a challenge to carve with much detail as the wood wants to split and splinter rather than accept being carved. The pencils to the right are of the newer plastic resin material, much easier to carve and this resin takes detail with small tools very well. These are the tools I generally use for carving pencils. a RED retractable utility knife, the type that you can break the tip off for a new cutting edge.This was bought at my local general store for 49 cents. 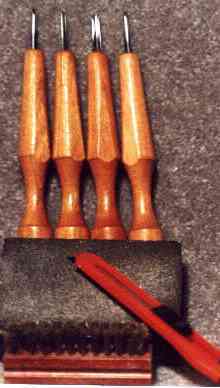 four small power grip carving tools, two are small rounded gouges and two are small V tools. These were bought at Lee Valley Tools. the good old spongy sanding block. I don't remember where I bought this, Oh Yeah it was at a Wood show but they are in most every tool store, regular sand paper could be used too you know. a little brass wire brush. Good for helping the clean up of a carving. The first step is to remove the paint finish. Use the utility knife for this carving. Do not cut too deep as the lead is really not that far below the painted surface. I generally do this on the printed side of the pencil. Now on to some carving. Use a v tool and follow the lines of the face squiggle. Once again do not cut very deep. These incised lines will act as a guide for further carving. Take a look at the forehead area. The utility knife was used to carve an indentation along the forehead line, also under the eyebrows cheeks and even along the sides of the moustache and nose. The pencil wood (errr, plastic) spirit is starting to take shape. Now here is the profile view of the previous picture. The nose and moustache areas are still rather flat and certainly need some more shaping. The good old utility knife has done a bit more shaping. There is now a definite facial profile. The nose sticks out the most, the cheeks have been carved a bit further back. Carving down the bridge of the nose and the top part of the moustache adds to the better profile appearance.The small v tool was used to make the eye brows more apparent by making a little valley on the bottom part of the forehead. On to the front view of the last profile. Here I have drawn in the top of the eye brows to show where the V-tool was used. I have also drawn the top and bottom of the lower lip, the upper lip is usually ignored in this style of carving. Note that part of the nose has been thinned down and what we might call nose wings are apparent near the bottom of the nose. There are no eyes yet but part of the eye mounds are visible just under the eye brows. The eye mounds are now more apparent as the bottom of each eye mound has been carved with a v tool. Shaping the top of the cheeks and near the sides of the nose adds a little more life, hey. The hole to represent the mouth has been carved with the utility knife and the lip has been shaped a bit. the eyebrows have also been shaped a bit more so the are more visible. A little more fibre has been removed from under the lip and between the two sides of the long moustache. Do you now see some texture in the hair, eyebrows, beard and moustache? The small round gouges have been used to carve this texture. The smaller of the two gouges is suggested for the eyebrows and moustache. Here is a quick look at the profile. Not too bad, hey!! A little bit of sanding was done with the sponge sander and then some cleanup with the brass brush. By the way this little brush was bought at a shoe store. On to the final stages. I added some wrinkles with the little v- tool on the forehead and just under the eyes. The hair was textured a bit more with a V-tool, then I painted. My favorite paint is "DELTA CERAMCOAT" , it is a nice water soluble artist's acrylic and comes in many colors. You can't see the eyes very well from this photo but to finish them I painted a semi circle of green followed by a smaller one of black then a tiny dot of white. The face was antiqued with a watered down DELTA gel stain, some of this stain was then wiped off with a soft rag. I finished the carving with one coat of DELTA satin varnish. Bye for now, as usual I had fun writing this. keep the coffee pot warm, hey!! Please let me know what you think of this article, I hope you enjoyed it.